The Common Cemetery of Tielt is to be found on the ring-road. 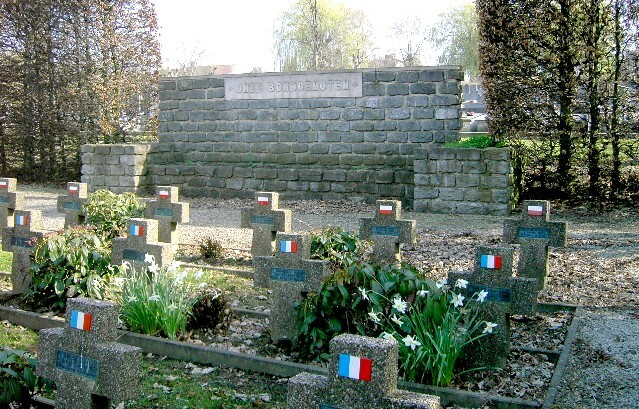 In the Militairy Plot 8 Polish victims of the 1st Polish Armoured Division have been buried. Part of the chapter "Thielt" out of the book: "With the tanks of the 1st Polish Armoured Division" author K. Jamar. The road was good and the men cheerful. The sun rose slowly. The drivers put on speed, anxious to get to Thielt with the least possible delay, to prevent the Germans from organizing their defence. Lieutenant Dzierzek reported that he had reached all the control points fixed on his route, along which his troop had passed without firing a single shot. The enemy had not shown up. From a distance the church tower at Thielt could be seen. A machine gun opened fire to the right of the road. It fired one burst and then stopped as though ashamed of its helplessness in the presence of tanks. The units reached the first houses at Thielt. Lieutenant Godowski's patrol approached cautiously, but silence reigned. No Germans were to be seen. Crowds gathered immediately in the streets. How was it possible that so many people could collect there? There was no room for everyone on the pavements, they overflowed on to the roadway. They shouted with joy and threw flowers, whole armfuls of flowers. A Belgian flag was hoisted, a second, a third - the enthusiasm of the crowds increased. Someone in the crowd realized that it was a Polish unit which was liberating the town. He shouted "Vive la Pologne". Soon many voices took up the shout. But as the troop advanced into the centre of the town the shouting died down and the streets grew emptier. the flags disappeared. One more turning, and the next street lay completely empty, doors and window shutters were closed. The street turned once again before debouching into the market place. Two Stuarts took up positions at the end of the street and fired with their machine gun. Lieutenant Dzierzek drove up. On the opposite side of the Market Place stood the town hall. In front of it a German passenger car was ablaze, a body lay on the pavement and two officers were running towards the entrance. Our fire just caught them and they fell to the ground in the open doorway. Somewhere a Spandau started firing. 2nd Lieutenant Godowski and his wireless operator suddenly ducked inside the tank turret. Dzierzek realized the position. The temporary silence of the Germans was due to surprise, but that did not mean that Thielt would fall into our hands like ripe fruit. The tanks had advanced too far. Godowski's tank moved forward, turned and re-entered the street. An anti-tank shell pierced a bogey wheel and the tank came to a standstill. No one jumped out. Quick action was imperative. "Hullo, all stations Oboe, forward gunners to the front!" called Dzierzek. He jumped from his tank and together with Lance-Corporal Seroka sheltered in the nearest doorway. 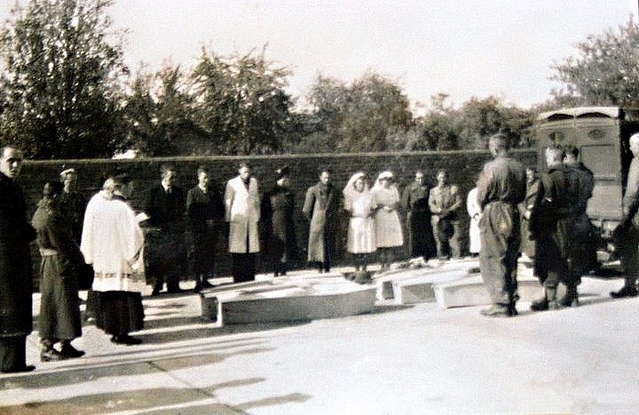 Orders were issued: 2nd Lieutenant Marcinkowski with the Mortar Platoon was to search the houses in the rear, 2nd Lieutenant Bratkowski those behind the church on the left and 2nd Lieutenant Soltysiak those on the right. A German peered from behind the corner of a house and fired a panzerfaust into the immobilized tank. The grenade fell without exploding. Seroka was already flat on the ground and a Sten burst finished off the German. He would fire no more panzerfausts. At that moment the hatch of the forward gunner opened at last and Trooper Grzesiak jumped out, and ran limping into the street. Dzierzek jumped on to his tank and looked inside. 2nd Lieutenant Godowski's body lay across the gun and blood oozed on to the breech ring. Next to him was stretched the body of Lance-Corporal Pietrzyk his head thrown back. Dzierzek got off the tank. He felt something strike him in the back and turned round: there was no one there. It was merely a burst from a Spandau: eight holes in his battle-dress and eight weals on his back. He was lucky that time. "De Bevrijding van Tielt" Published in september by 1994 "Stadsbestuur Tielt" and Heemkundekring "De Roede van Tielt".